From September to December 2016, I traveled to Standing Rock to cover the largest Native gathering since Wounded Knee. Dakota Access Pipeline protesters pour into the main area of the Oceti Sakowin camp at Standing Rock celebrating the Army Corps of Engineers decision to not grant permission for the Dakota Access Pipeline to cross under the Missouri river on December 4, 2016. Protesters make a camp along highway 1806 near the DAPL construction site to watch for the possibility of the company working through the night. Kristen Wahquahbowhkuk, 11, flies down media hill on a skateboard donated to children at the Standing Rock protest camp. Wahquahbowhkuk and his family traveled from Kansas and have been at the camp for months. Protesters work to winterize camp structures in preperation for a blizzard. Protesters look over the Standing Rock protest site on a hill dubbed 'media hill'. 'Media hill' was one of the few places in the area cell phones were able to get reception and was often puncuated with people making calls and checking social media. Thousands gather on highway 1806 for the veterans march December 5, 2016. 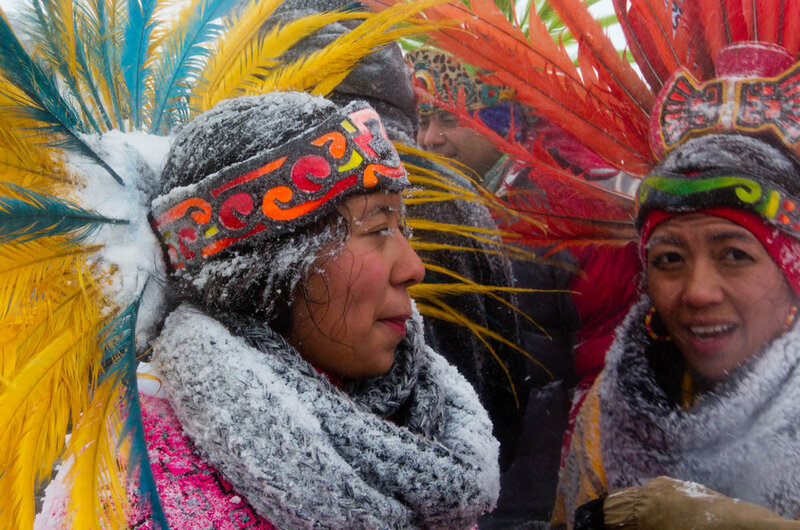 Snow dusts Alquetzali Quirozo's eyelashes and regalia as she walks along highway 1806 back to the Oceti Sakowin Camp. Quirozo danced with her parents during the veterans march to the frontlines on December 5, 2016. Campers at the Oceti Sakowin wait in line for breakfast at one of the few kitchens in the campsite.